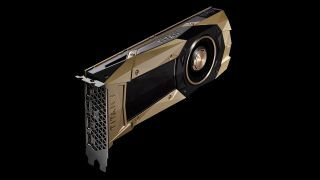 Nvidia has unleashed a new Titan graphics card which it’s billing as the most powerful GPU in the world. However, it’s not aimed at gamers, but rather AI and machine learning – with a powerfully frightening price tag to boot at $2,999 (around £2,230, AU$4,000). Nvidia’s Titan V is the first ‘consumer-grade’ card (i.e. the Titan brand, as opposed to Tesla) to use the company’s new Volta technology (the next step on from Pascal, which powers the current GeForce 10-series cards), and it boasts no less than 21.1 billion transistors, delivering a jaw-dropping 110 teraflops of computing power. With new Tensor Cores tailored specifically for deep learning, it offers nine times more peak computing teraflops compared to its predecessor, the Titan Xp. As mentioned, this is aimed at serious applications by scientific researchers in the fields of AI and high-performance computing in general, with a focus also on energy efficiency as well as power. Nvidia notes that Titan V sports a major overhaul of the streaming multiprocessor at the heart of the card, and it’s twice as energy-efficient as its Pascal predecessor. In total, the card has six graphics processing clusters, 80 streaming multiprocessors, 5,120 CUDA cores (compared to 3,840 in the mighty Titan Xp) and 320 texture units, with a base clock of 1200MHz and boost clock of 1455MHz. The Titan V also boasts 12GB of on-board HBM2 memory, with a total memory bandwidth of 652.8GB/s. The TDP is 250W. It’s a big step forward, and one that we hope will reflect an equally large stride to be taken when more affordable consumer and gaming-targeted Volta cards hit the market. Officially the Titan V is considered a consumer-grade GPU, and indeed Nvidia’s first HBM2-equipped ‘consumer’ graphics offering, but obviously it isn’t aimed at your typical PC user (if anything will give you a clue about that, it’s the three grand price tag). The new Titan V is available from Nvidia now, with a maximum order of two per customer in place. You get free shipping, too, although that may not quite take the sting out of the price tag.